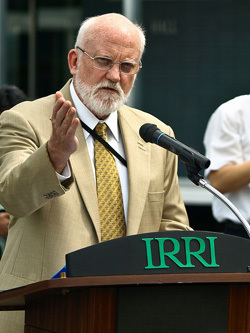 The Director General, International Rice Research Institute (IRRI), Robert Zeigler, has urged every gene bank in the world to re-design their databases to match some international standard, saying that what is needed is inter-operability, to create portals where everyone's databases can talk to another, NaijaAgroNet reports. The Philippines-based International Rice Research Institute (IRRI) and the Treaty (ITPGRFA) NaijaAgroNet informs, made the announcement at the 6th session of the Governing Body of the FAO-based 136-member nation plant treaty that is being held in Rome this week. Around the world governments and organizations are storing genetic material in seed banks, but without one single gateway to genetic resource data, it is very difficult for researchers and plant breeders to know what is held where and what genetic resources are contained in the seeds. The Secretary of the International Treaty, Shakeel Bhatti, said, "The genetic information that IRRI is making available to us, and the public at large, is a hugely generous and significant show of support to our endeavours to make all relevant information on genetic resources on plant crops available for future food security."